Custom sizes & fabrics are always available..
Alton is the epitome of smart tailoring for a more sophisticated restaurant. The Alton banquette features a biscuit tufted back and tapered legs. Customize the fabric and finish to suit your restaurant's dining room. Custom sizes & fabrics are always available. The grace of the Amelie design features diamond tufted back with turned tapered wood legs. Available with optional nail-heads for a more formal dining room. Customize the fabric and finish to suit your bar or restaurant. Create an imposing impression with and feature this grand banquette in your restaurants dining room. Aqua is elegant with tapered legs and a simple square upholstered seat with welt detail. Perfect for the casual-chic restaurant look. Customize the fabric and finish to suit your restaurant space. The Barcelona banquette is a taste of Mediterranean style. Custom turned wood legs can be stained in a variety of colors to suit your color scheme. Bold antique brass nailhead detailing provides the perfect tasteful accent. The Bellevue banquette offers a design that's sophisticated, bold and comfortable. The over-sized wing back creates dramatic strong contemporary lines that speak of a traditional design but scream elegant Miami restaurant! Natural wooden legs add to this masterpiece of comfort and style. Our Astoria banquette with the wedge corner is perfect for maximizing the corners of your bar or dining areas.. We’ll make it the size you need. Customize it to your taste and create just the perfect fit for your space. in any restaurant's decor including traditional or contemporary. Spun wood legs and nail heads bring out just the right amount of detail. The tall curved back adds to the Barcelona’s dramatic presence and would look great in your Latin inspired dining area. Great design for bar seating with high-tops. Makes eating in the bar more of a dining experience. A cozy and sophisticated statement is created by the addition of tapered wood legs. Customize for your casual comfortable restaurant! The banquette's curved legs and nail heads add just the right amount of detail. A few of these in your restaurant along with the tall curved back adds to the Baroness’ dramatic presence in your dining area. Perfect seating for your restaurant's lounge area or VIP nightclub "Bottle-Service" seating. This designer banquette is perfect with its back to the wall for a side by side deuce. This restaurant banquette features a sturdy wood base, vinyl cushions and a low back. Storage in the base is available with a flip up seat. Custom sizes & fabrics available. Celeste features vertical channels on a curved back with a dressmaker skirt. For the formal restaurant dining experience. Available in custom sizes & fabrics. The large seat with wide angles is the epitome of style & more importantly of comfort. It will shine in any seating area in your restaurant. Custom sizes & fabrics are aways available. The Calypso is a perfect design for the ultimate in chic comfort and classic styling for any restaurant. Perfect for a "Grand Lounge"
*Available in customs sizes & fabrics. For the chicest of restaurants who pamper their customers with comfort and style. Customization is not available. Use this look to make a statement in your restaurant. The City Living banquette boasts plush sectioned cushioning creating a city-sleek design. In an L shape or straight design, that will work in any dining room or restaurant seating area. Traditional unadulterated classic design reminiscent of yesteryear and also works well as part of a restaurant's eclectic theme. Add character to your restaurants atmosphere with these beautiful designer banquettes. A classic silhouette is displayed with a comfy contoured back. The framing detail on t base provides the perfect accent and clean design for center isle seating. This open design with wooden legs opens up a room and lends itself to efficient use against long wall and easy to move when rearranging a room for a private party.. Perfect for rounding off corners in your restaurants dining room. The Corona's wide wood base is complemented with curved rear legs and tapered front legs.. The high tufted back and deep seat contributes to it's sophistication. A great look for your nightclub also. Dante features an elegant curved silouhette with turned front legs with casters make it ideal for restaurant seating at 60″ round tables. Also available with nailheads. This Banquette's wingback feature and is curved legs scream elegance and comfort, both things your dining patrons appreciate and is often in short supply. statement piece great for your lobby area. The Fargo Banquette is the epitome of fine tailoring and sophistication with its gently arched back and tapered legs for ensemble restaurant seating. Fiesta’s characteristic bold stripe and festive green seat will brighten any restaurant dining room. A wood sub-base with tapered legs add style. The Flipside is an L-shape style banquette with a little twist. If your booth's back is visible, give your customers some fun and style ! Sleek and decorative for high-end fine dining establishments. Contemporary and classic at the same time for those seeking eclectic restaurant decor. As always, custom sizes available. Ginger’s L-shape is convertible into two straight sections when rearranging your restaurant for private parties. A contrast-welt on the banquette's seat adds definition. The Georgette is a beautiful designer banquette that would look great in any restaurant that boasts comfort, style and subtle detail. The Gamma Banquette is curved and custom built to fit an oval table. Our curved banquettes can be custom made for any round table. This stunning banquette adds an elegant dimension to any restaurant's ambience. The Ithaca banquette is stately with slender birch wood legs and would be appropriate for a more formal restaurant dining room. The gentle slope and shape of the back and arching rear legs work great in a room where the back of the banquette is visible. The addition of the Old-Silver nail-head detail accentuates the sleek styling of this Banquette and will do the same for your restaurants decor. Jeannie is a real show stealer with lots of vibrant personality. Tapered legs and a thick upholstered seat with welt-detail will attract the right kind of attention in your dining establishment. Kaleidoscope will makes its mark in your restaurant with this sunburst patterned. The contrasting piping adds special detailing that's striking and elevate this banquette into high style. This designer banquette features a luxurious diamond tufted back and a painted base. The piece will compliment nice restaurant china and crisp linens! This designer banquette is beautifully and elegantly appointed with tapered legs, a princess-tufted back and welt detailing that makes an attractive and durable addition to your restaurants appeal . The rustic elegance of this linen covered banquette is perfect for your restaurant's customer waiter area. 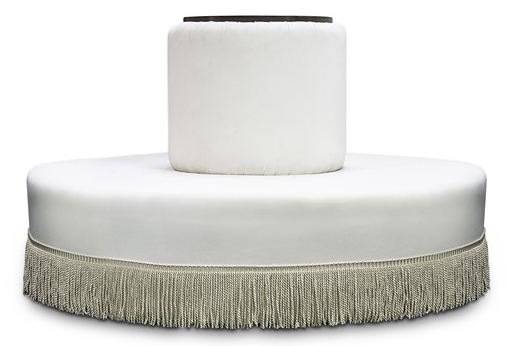 This classic design features sophisticated diamond tufting on the back and seat. Picture the gracefully-tapered walnut wooden legs andthe plush lines of this masterpiece in your restaurant, bar or nightclub. This banquette in your restaurant is the height of subdued sophistication. The subtle 2-button tuft on the back creates a look of style that is enduring & contemporary. This Designer Banquette features clean lines and durable construction with tapered wood legs. Simple traditional and durable design for your dining room in the country. The Maestro Designer Booth is perfect for private and intimate restaurant dining. The deep diamond-tufting on the back-seat is rich and luxurious look. This banquette boasts classic lines and a plush sectioned cushioning that creates a solid but sleek. A wedge-shaped corner provides an additional seat for your dining patron. This piece is also available with closed ends or Parson's legs.. This favorite banquette's classic lines, the subtly curved back legs combined with the plush cushioning create a timeless design that is extremely comfortable and durable for restaurant use. . Available in “L” shape or straight. This designer banquette boasts an impressive and "tall" back with button detailing that makes a bold statement in your restaurants dining room. The radius of the curved seat can be made to accommodate your restaurants round tables. A tasteful choice of fabric for this custom banquette can dial up the volume on its designer attributes and translate into impressing your restaurant clientele. This designer banquette features an extremely tall and dramatic back with button detailing. This fine piece of restaurant furniture can make an incredible impact statement and lasting impression on your customers. Simple, sophisticated and understated, this designer piece has double thick cushioning for your patrons assured comfort. side add a contemporary dimension to this design and the elegantly curved wooden legs add sleek lines. The Medley banquette is an excellent choice for customizing options. Its contemporary arms make it easy to accommodate a variety of spaces and rearrangement scenarios. This beautiful piece of custom crafted restaurant furniture is perfect if floating in the middle of your dining room, displaying a smooth a elegant curved upholstered back. This circular designer banquette is the perfect centerpiece for the center of your restaurant's dining room. This opulently designed also feature a princess-tufted inside triangular back and pillow-top cushioned seat. This dramatically and stunning designer banquette will attract the attention of your restaurant customers when they see this imposing high circular back. the secret to getting the most out of this piece is in the fabric selection! This custom banquette combines its tapered wood legs with a creamy neutral luxury vinyl upholstery. Designed to fit into tight space in your restaurant and still show-off dramatically high back.. This Curved Designer Banquette has tall legs that lighten and contemporize the look and feel and the open styling creates airy sophisticated look. Available as a straight backed banquette. This custom banquette is luxurious in pure white with tapered legs, an its diamond-tufted button-back with welt detail will command the attention of your restaurant patrons. This sleek modern designer banquette has legs that flow. This fully upholstered stylish masterpiece of craftsmanship and design will have your restaurant guests talking!. This ultra high-back custom banquette is the epitome of creating dramatic effect. Large biscuit-tufting provides the focal detail that will make this seating in your restaurant extra special. The sophisticated custom banquette is designed to fit perfectly into the corner of your restaurant's dining room creating a luxurious space-saving nook-seat.. This modified restaurant-booth has been transformed with a sophisticated wood border and tapered legs custom-stained your desired color. Our Orangina Designer Banquette is a generously sized slice of modern design with its round satin chrome legs and would please any restaurant customer comfortably and visually. A stunning design and a stunning fabric choice make for a stunning custom banquette as illustrated by our Paris Bench Custom Banquette. Pepper is the perfect solution for maximizing a corner or nook's usefulness in your restaurant or bar and adding some pizazz . A “knock-out-design” this custom-tailored banquette will stop your restaurant customers in their tracks. Upholstered in gold metallic vinyl for a dramatic and trendy statement. This designer centerpiece banquette's opulence is appropriate for you're nightclubs VIP Bottle Service Lounge, or as the focal point of your dining room under a crystal chandelier! This eye catching custom banquette piece will be the "center" of attention in your bar or restaurant space. This custom banquettes simple profile with split cushion adorned with two-buttons will pop with it clearly defined detail in your bar, lounge or dining room. A perfect focal piece for lounging and mingling in your bar or lounge. Make an entirely different look with a fabric change and the addition of some contrasting trim. Rouge is the epitome of smart design, custom tailoring and stylish sophistication. Its biscuit-tufted back and stained tapered wood legs make it an appealing addition to any restauranteur's seating option. The RL custom banquette, classic & sophisticated with its comfortable billowing seat, dark wooden legs sleek design make this a masterpiece that would enhance and elevate any restaurants decor. This custom banquette at "bar-height" is ideal for lounge and long bar walls. It will maximize your seating capacity and can be used with your high-tops and bar stools. This custom banquette will dramatize any restaurant space. The fluid undulating curves are accentuated by the durable “ice trax” sleek vinyl upholstery. This fantastic European Designer Banquette will add an immense amount of character and flavor to any restaurants dining area. The plush Simone custom banquette features a diamond-tufted back and a dressmaker-skirt. Can be made with exposed tapered legs for a light feel. Its the perfect compliment to a four-top, opposite 2 dining chairs. The Savoy’s custom wing-back design trimmed in nail-heads illustrates its detailed craftsmanship. Long tapered legs heighten it tradtitional appearance. This custom banquette is modern and contemporary "one-of-a-kind" piece when combined with interested & contrasting fabric choices supported by the bold satin chrome legs...a stand-out in any restaurant's dining room. This custom banquette will make sophisticated statement in your restaurant with its strong tapered wood legs and strong design. Shown In: Kravet fabric and cocoa leather. This gorgeous custom banquette was custom designed for the St. Moritz restaurant and is a great example of how impressive a piece can be when customized with the right fabric selection. See complimenting wall banquette. This fresh and beautiful banquette is detailed with antique-brass nailhead trim yet still has a fresh spring look and will "freshen-up" your restaurant's dining room. Available in custom sizes & fabric. This sleek, simple clean-look Banquette is so handsome and provides ample comfortable seating with a 60″ round table. This custom design with the accent button in the perfect place, contrast welting provides some additional detail. This gorgeous custom wall banquette was custom designed for the St. Moritz restaurant and can also float in your restaurant's dining room. It too is a great example of how impressive a piece can be when customized with the right fabric selection. This custom banquette features a smaller curved silhouette w/ turned front legs and rolling-casters that make it easy for you to rearrange your seating area to accommodate your restaurants needs. This banquette unites both style and function with a timeless sophisticated design and will enhance any modern restaurants decor.. A flip-top storage space is also available to be built into the seat. As Displayed: Grey and White Zig Zag Fabric. This contemporary banquette with its minimalist look is perfect for those operators looking for that trendy look that todays restaurant goers appreciate. This elegant white banquette is the perfect choice if you are going for the "all-white" contemporary look that never gets old. This designer banquette with an impressive and high straight back accentuate its modern design and can be a centerpiece in any restaurants dinning room. The white plush vertical channel design of this beautiful piece is upholstered in stain-resistant faux-leather upholstery which makes it easy to keep it looking pristine. This custom's bold design is sophisticated and comfortable. The straight seat & back display strong contemporary lines and work well in a casual contemporary restaurant's dinning room. This bold piece features bold vertical lines that make a strong statement. A Touch of modern with a touch of traditionally inspired detail for the comfort of your guests. The stylish design of our booths & banquettes will not only add some WOW-FACTOR to your atmosphere they will also be unique to your establishment. Our pieces are sleek, make a statement and look & feel like quality furniture, a far cry from the old fashioned boxy booth #32 on many of these restaurant seating sites. You cannot compare the poorly made compressed fiberboard seating offered my many of the larger manufacturers with the skilled craftsmanship, durable construction, quality materials and bold design used in the construction of our designer furniture. We use kiln-dried hardwood frames, sinuous coil-springs and webbing for durability & resilience, and high-density foam for support and comfort. Even better, our booths and banquettes are designed and built ergonomically correct. This means they are the right height & depth so your guests can sit-up comfortably because our construction provides the proper lumbar support to their backs. Browse our designer banquettes & booths, you can purchase them as presented or if you don’t see a booth or banquette thats suits you, let us know and we will work with you to alter the dimensions & design to your specifications and always at a competitive price!